Creating cloud-connected applications sometimes require significant time and resources for embedded designers to develop necessary expertise in communications protocols, security and hardware compatibility. Developers often overcome these challenges with large software frameworks and Real Time Operating Systems (RTOS), which results in increased development time, effort, cost and security vulnerabilities. 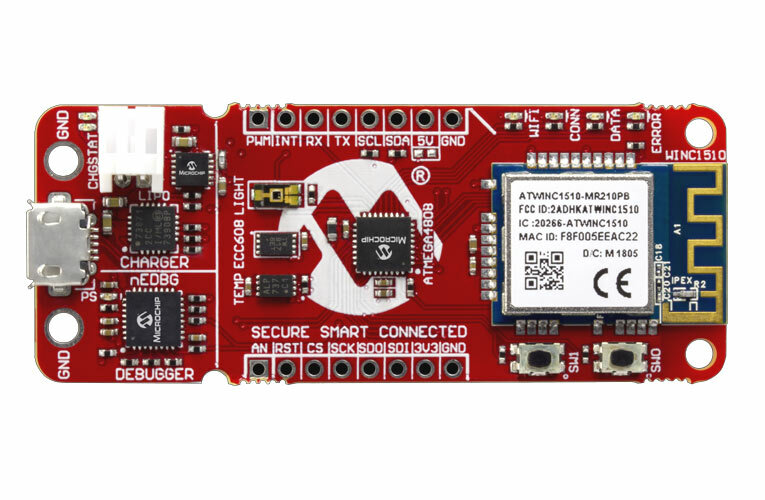 Microchip Technology released a new IOT rapid development board as part of an expanded partnership with Google Cloud, enabling designers to prototype connected devices within minutes. The solution combines a powerful AVR microcontroller, a CryptoAuthentication™ secure element IC and a fully certified Wi-Fi network controller to provide a simple and effective way to connect embedded applications. Once connected, Google Cloud IoT Core makes it easy to collect, process and analyze data to inform decisions at scale. Powerful AVR microcontroller (MCU) with integrated peripherals: The ATmega4808 8-bit MCU brings the processing power and simplicity of the AVR architecture with added advanced sensing and robust actuation features. With the latest Core Independent Peripherals (CIPs) that decrease power consumption, it provides cutting-edge performance in real-time sensing and control applications. Secure element to protect the root of trust in hardware: The ATECC608A CryptoAuthentication device provides a trusted and protected identity for each device that can be securely authenticated. ATECC608A devices come pre-registered on Google Cloud IoT Core and are ready for use with zero touch provisioning. Wi-Fi connectivity to Google Cloud – The ATWINC1510 is an industrial-grade, fully certified IEEE 802.11 b/g/n IoT network controller that provides an easy connection to an MCU of choice via a flexible SPI interface. The module relieves designers from needing expertise in networking protocols. Among the benefits of connecting devices to Google Cloud IoT Core’s infrastructure are the powerful data and analytics that enable designers to make better, smarter products. As part of the infrastructure, embedded designs can better take advantage of, and respond to, rapidly changing conditions across many sensor nodes.